Fly fishing for Steelhead? Drag setting is an important detail that is often overlooked. A properly set drag will ensure that you have the best opportunity to get a good hookup and land a higher percentage of steelhead. Setting the drag correctly involves a number of factors. When fishing the swung fly, a drag set on the lighter end of the spectrum is best. This helps with the initial connection and allows the fish to turn with the fly seating it properly in the mouth of the fish. A drag setting too tight at this point will only result in the fly tearing out of the mouth as the fish turns or in some cases with a smashing hit culminating in a broken line. Too light of a drag setting and the reel will backlash with a burst of speed and you’ve got trouble. (Steelhead can burst up to 35 mph). For starters the drag setting on your fly reel needs to be just heavy enough that the reel does not backlash. Next is balancing your drag setting with the stiffness of the rod you are using. Fly rods should be in a good parabolic bend absorbing the thrashing of the fish during the heat of the battle. If your drag is set too light it does not allow the bend of the rod to form- too heavy and the rod simply flattens out losing it’s shock absorbing ability. Proper drag setting is paramount if you want to pass the test of a steelhead battle. If your reel has a numberical value next to the drag this can help you make sure you start each day with the proper setting. I love my Sage Domain Reels that have a numerical system on the drag. I like mine set at 2.5 for optimal success on the swung fly grab. Some anglers find that setting the drag light for the hookup and then several clicks heavier for the battle is the best you can do. However you approach it, carefully setting your drag will increase your hookup and landing ratio. 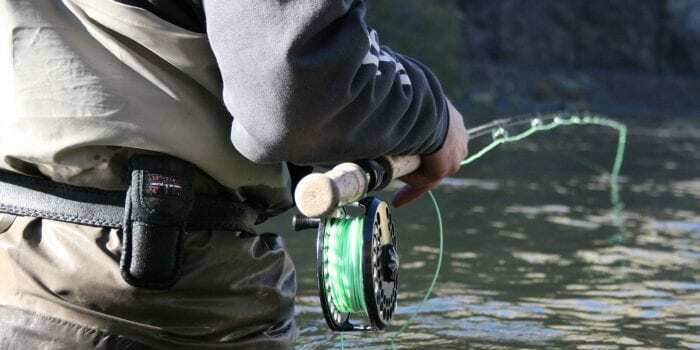 Previous article	Fly Fishing Portland – June’s Hottest Fishing!